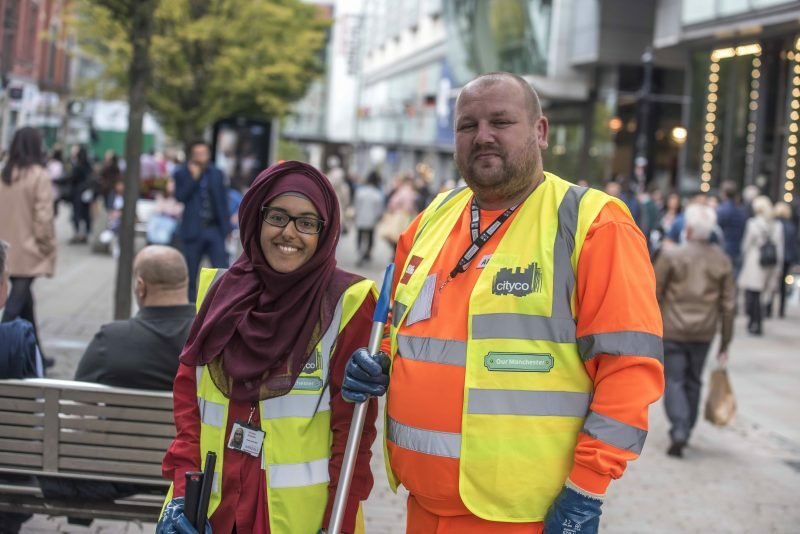 Following our deep-clean of Piccadilly Approach with partners Biffa, Greater Manchester Police, Manchester City Council and Street Support, CityCo’s Operations Team coordinated another day of action on 20th September around Piccadilly Gardens and Market Street. We had great a team of volunteers from members Bruntwood, Manchester Arndale, MJMapp and partners City Tower and Riverside UK. Pavements were jet-washed, plants pruned, grass mown, stickers removed, lamp posts painted and bins cleaned. This follows a CityCo day of action in the spring – and more events are planned. Please volunteer a team to help out. To register interest email operations@cityco.com. Our series of clean-ups support the city’s Our Manchester strategy.